Home / Parking Matters Blog / The Hot, New Shared Transportation Method? E-scooters. The Hot, New Shared Transportation Method? E-scooters. Just when you thought you had bike-sharing down, there’s a new trend in town and some say it might make the bike-share market seem tiny in comparison. It’s electric scooter-sharing, and spurred on partially by nostalgia, partially by practicality, and partially because it’s just fun, it’s predicted to be the next hot trend in transportation. Several bike-share companies are launching similar systems for electric scooters in existing bike markets. Bird, a new player in the market, says they’ll introduce the vehicles in 50 markets this year, including Washington, D.C. LimeBike announced plans to take some dockless bikes out of its D.C. fleet in favor of scooters this year, too. 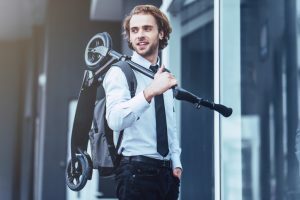 Fans say the scooters are easier to maneuver than bikes, more comfortable for the operator, and much more practical to use in business clothes, making them particularly attractive to transit users who need that last-mile solution. Are electric scooters coming to a share-system near you? Read the whole story here.